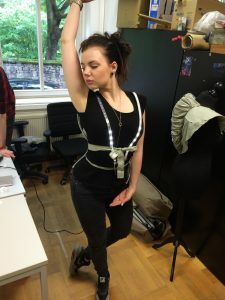 While sewing the costume, it´s important to test if the technology still works if you wear it on your Body. In a quick-and-dirty test, we put on just the technology to see how it feels to move with it. Will it hinder you in your movements? Will the LEDs still work, if you do some big and sweeping moves? Will you be able to move every part of your body like there ist no technology on it? 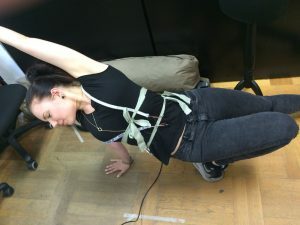 We testet some moves from the motion analysis. Result: It all work fantastic! There are no limitations in the movements and no defects in the technology while dancing.